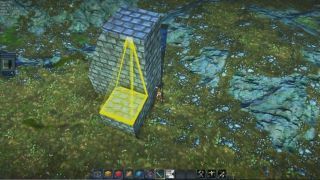 Very few of us who are not named Cory Banks or Tyler Wilde have been lucky enough to try out EverQuest Next Landmark hands-on yet. As much as we wish we could give everyone reading this that chance, here's the next best thing: an hour long livestream showing some of the first ever in-game footage of the construction tools players will have access to. Some of the details presented may be old news if you've been gobbling up every tidbit of information on the game, but the real time demonstration is the first we've seen of its kind. Sony's Dave Georgeson, Colette Murphy, and Terry Michaels provide answers to community questions and commentary as producer Eric Smith constructs a rather blocky but respectable redoubt. Georgeson is quick to point out that Smith is not a member of the art team, yet is able to use the tools in Landmark (which are the same ones the actual artists will be using) to create something reasonably polished in a very short amount of time. We also get a look at a slick battlemech Smith created in his spare time. If you haven't already, do yourself the favor of digging in to our EQ Next Landmark hands-on , and read about how SOE envisions the game becoming a new platform for D&D-style roleplaying .